yes... yes... i know... this is starting to turn into the Joan Didion fan page... so what if it is?! 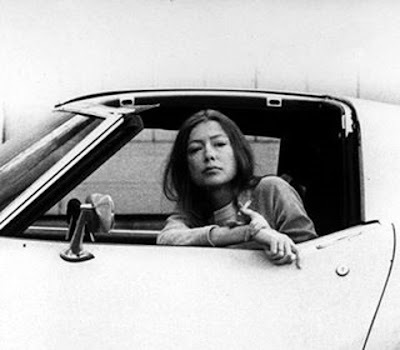 I just read this wonderful piece about Didion in the Paris Review by Lucy McKeyon. If you have a little time, read it, it is really great. But I do know that there is one kind of love that doesn’t require a person to love you back—one where the person might not even know you. And another where you might know someone all your life and then realize, at the end of hers, that you never really did. Doing what you love can help with this. Doing what you love allows you to remember so well, to feel so closely how you have loved, that you can forget the space between yourself and the words you draw with. Forget the distance between you and everything, everyone, else. Love becomes transmutable. Freud knew this. Writing can be an effective replacement mechanism—and in its solitude, there is antidote for the deepest loneliness. “It’s people trying to make sense of a fairly universal experience that most people don’t talk about,” Didion would spit back, as if to say, Yes, well, duh. 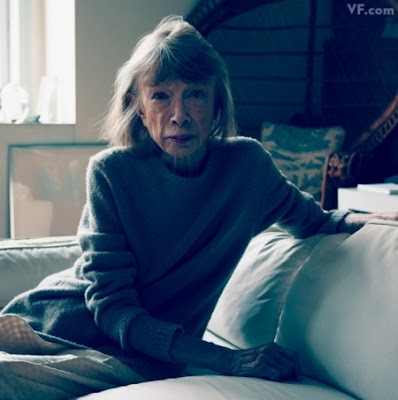 Didion knows her writing provokes a very personal, often emotional, response from readers. Desperate, even. Is remembering, then—is writing—a way to respond to the promising threat of forgetting? A way to figure out what you might actually think about something, without coming to any confining conclusions? A release—or a holding on?